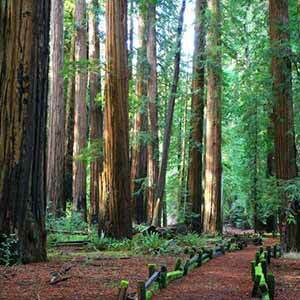 Smithe Redwoods features a small old-growth lowland redwood grove. As in so many other groves, Highway 101 (which at this point is a twisty two-lane road) runs right through the old growth. 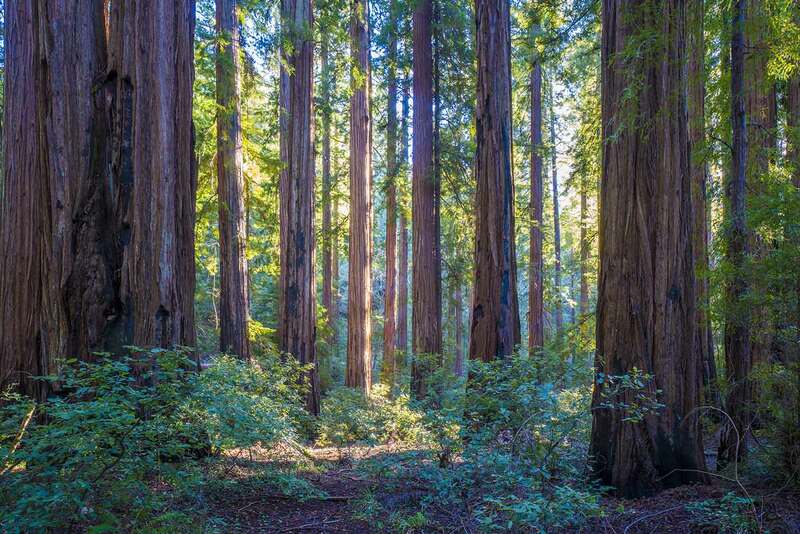 If you’re driving north from San Francisco, this is the first real grove of old-growth redwoods that you see from the freeway. There’s a small pullout — no on or off ramps and no facilities of any kind, just a little paved area by the side of the road — which serves as a popular highway rest stop. 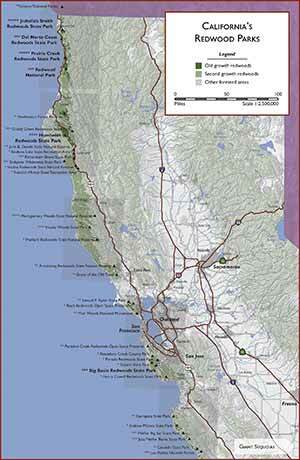 From this lot you can stroll around the grove or scramble down to the Eel River, where there’s a deep swimming hole. 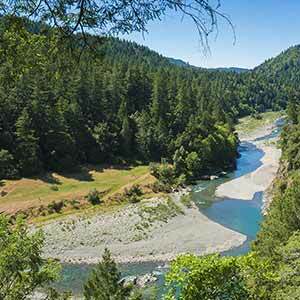 The redwoods grow on an alluvial flat a few feet above the Eel River. 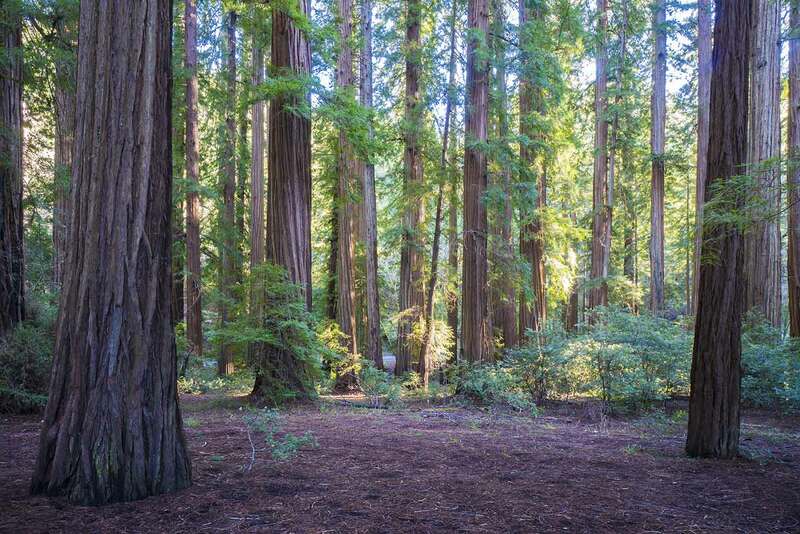 The reserve doesn’t have any trails, but it’s easy to walk around within the old-growth grove because past development and many visitors have worn away all the groundcover. The really big trees all seem to be right along the highway. The grove actually extends pretty far back; if you walk around a fenced-in area, the interior looks like a scaled-down version of Richardson Grove — the trees aren’t that big, but it’s a pure redwood grove, very open at ground level with straight stately trees emerging from the perfectly flat ground. 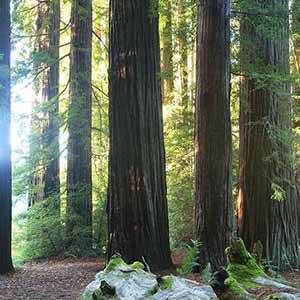 The grove would be even more attractive if it had the usual ground cover of redwood sorrel and ferns. As you might expect, a constant roar of traffic fills the little flat. There’s supposedly a waterfall that you can see if you walk under the Dora Creek highway overpass, but at the moment you can’t get there without swimming. The grove used to be a resort called “Lane’s Redwood Flat” . 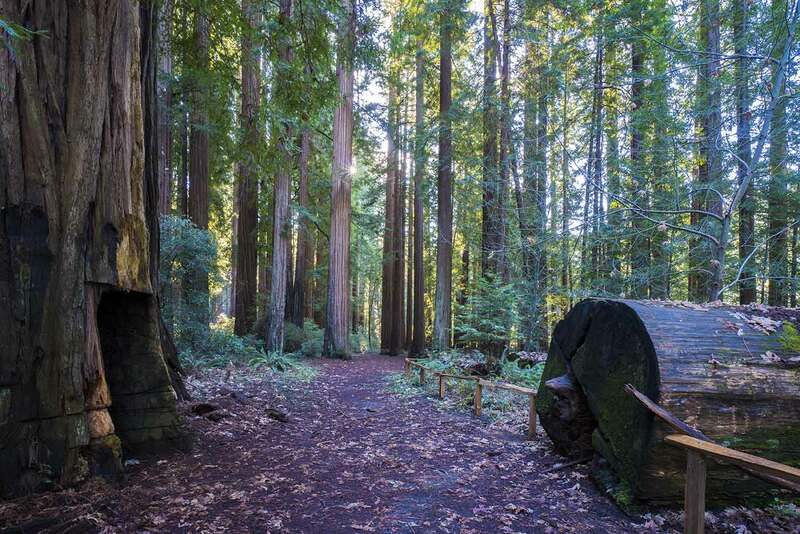 Next to the parking lot is a redwood with a walk-through tunnel that used to serve as the entrance to the gift shop. About 20 yards into the grove is a second sawed-off redwood with a similar tunnel. 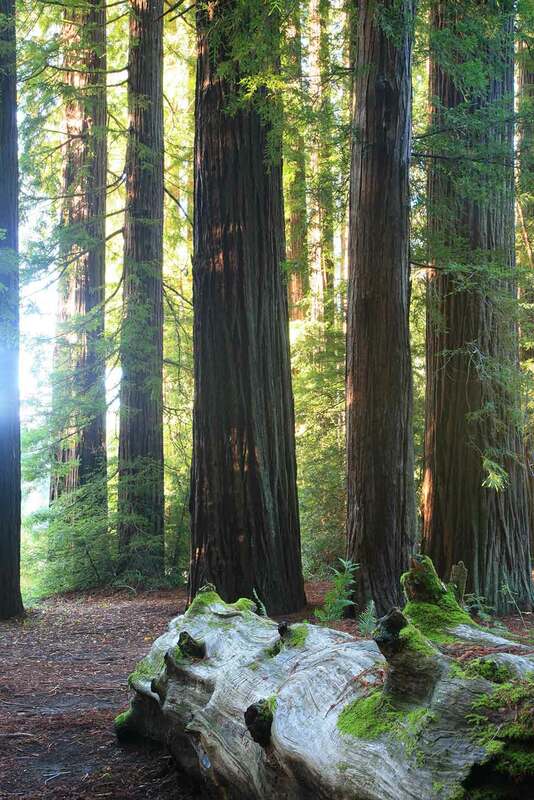 Both redwoods, though still alive, are now sawed-off at a height of about 12 feet. 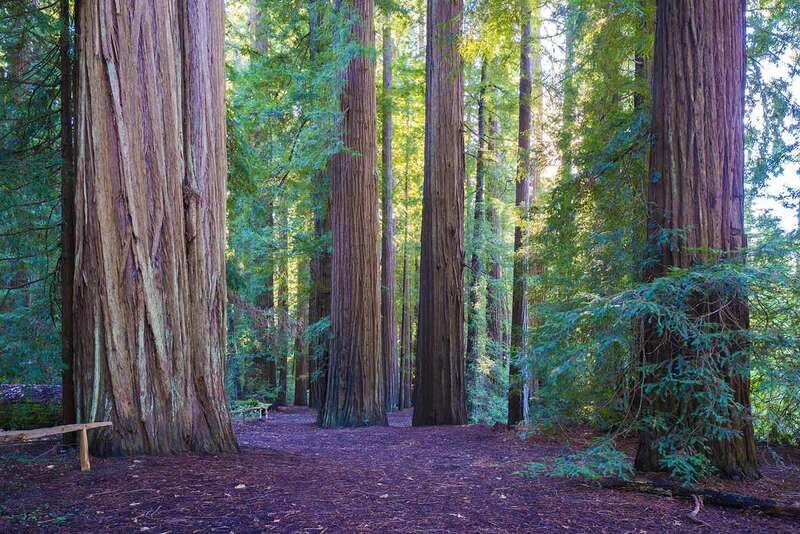 In vintage postcards, the roadside tree was clearly not sawed-off; redwoods with big holes carved in them usually last only a few decades. There’s no sign of the many buildings that used to be here, although you can still see the looping paths left by the access roads within the grove. 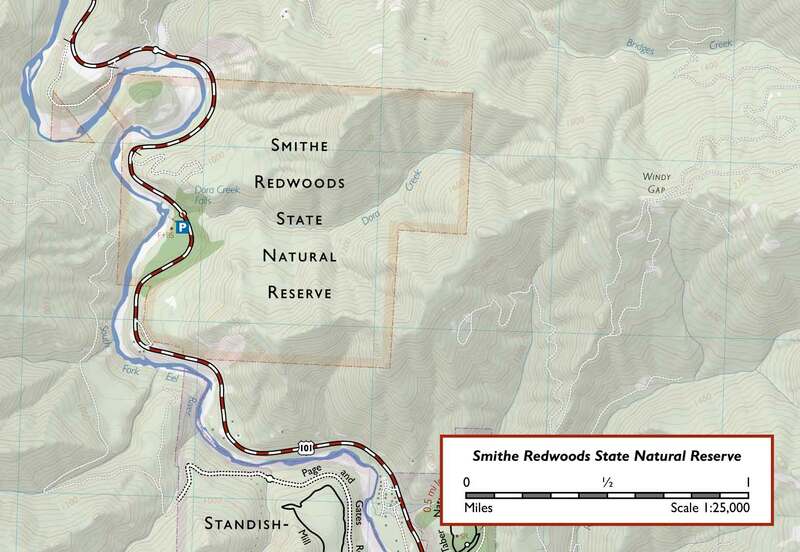 Here’s the reserve’s location in Google Maps or in Google Street View. 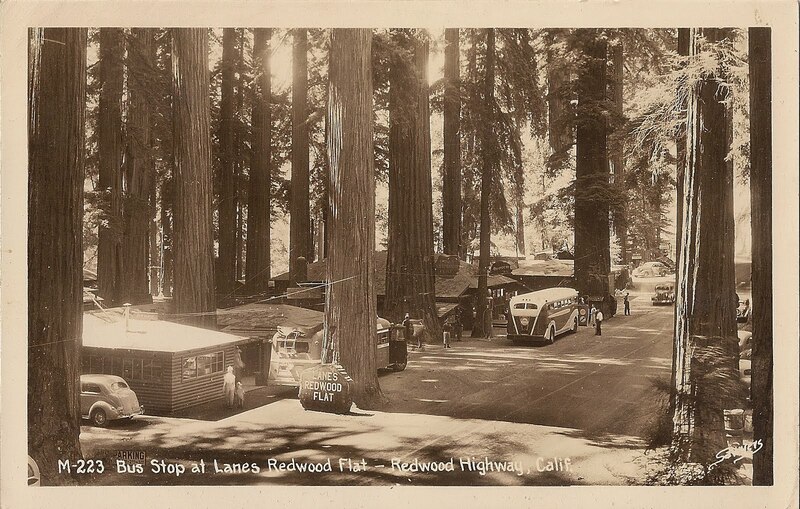 Vintage Vacations has trove of old postcards and photos of Lane’s Redwood Flat. 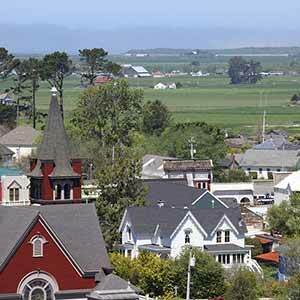 In particular, this nice overview photo of what’s now the Highway 101 pullout shows how heavily developed the grove used to be.